Congratulations to Andrew and Karl, two of the winners of the Penguin/Waterstones/Tiscali competition to win a day at Whitehall Roman Villa. 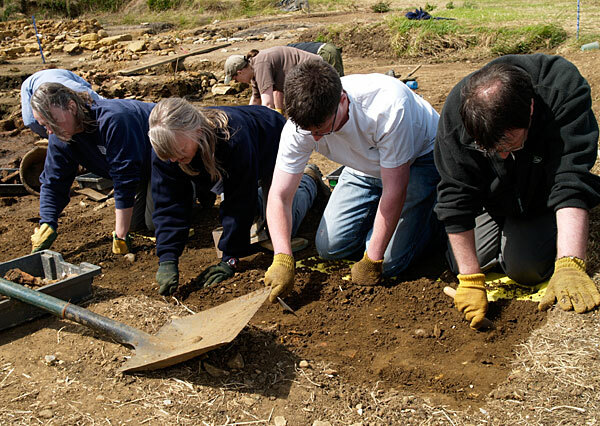 After a tour of the site and a peek at some of the best finds – some of which I’d never seen before either – they pitched in to join the diggers. Andrew (right) unearthed a piece of box flue, which would have been part of the bath house heating system. Karl is holding a tessera – one of the cubes used to make a mosaic. Sadly they were only there for a day so there wasn’t time for them to help dig out the other 249,999 or so required to reconstruct the rest of the floor. Commiserations to Kirsty and Daniel who should also have been there but were unable to make it on the day, and many thanks to Penguin, Waterstones and the good folk at the Villa who helped to make it all happen.